Assembled heavy Duty 4'X8' CNC Machine with Laser/Spindle Combo. The first CNC machine with a spindle and a laser. Large format heavy duty 4'X8' or longer perfect for standard 4'x8' sheet. 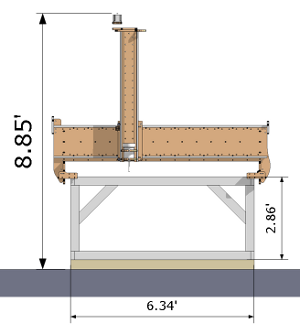 This machine offers a sturdy gantry with the capability to mill light aluminum. The laser is perfect for precision cutting of thin materials. Also great for etching and engraving. Watch the videos below for some great examples. Table Not Included.